Washington, DC – A church was shot up by a lunatic. The US government never lets a tragedy or crisis pass without attempting to find a new way to restrict the American people. So, we can expect a renewed push for gun control. There is a lot of propaganda about gun control. So much so that the truth has been lost. The National Rifle Association (NRA) would have you believe that guns stop murders. The gun control lobby would have you believe that gun control reduces murders. They are both wrong. Gun bans have always had the same effect once implemented: none. They do not create a (sustained) period of increased murders, nor do they reduce the rate of homicides. The gun control crowd is currently stomping their feet and screaming “No, it reduces violence! I’ve seen the statistics.” What you probably saw were studies that point to reduced instances of “gun murders,” not murder. The pro-gun crowd is screaming that gun bans cause crime. At least this is grounded in reality. Typically, there is a spike in murders immediately after a ban, but it is short lived. 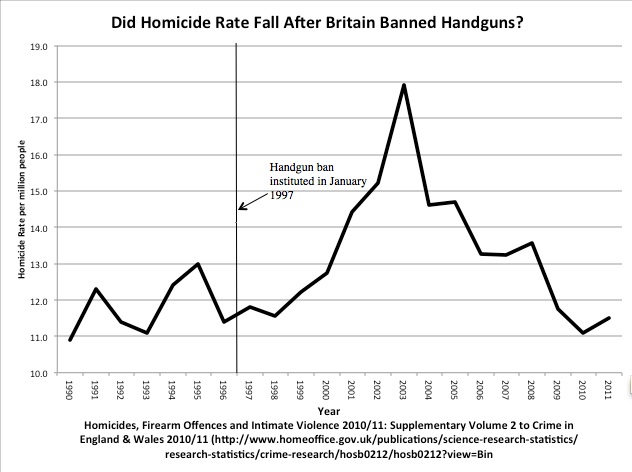 United Kingdom: The UK enacted its handgun ban in 1996. From 1990 until the ban was enacted, the homicide rate fluctuated between 10.9 and 13 homicides per million. After the ban was enacted, homicides trended up until they reached a peak of 18.0 in 2003. Since 2003, which incidentally was about the time the British government flooded the country with 20,000 more cops, the homicide rate has fallen to 11.1 in 2010. In other words, the 15-year experiment in a handgun ban has achieved absolutely nothing. Ireland: Ireland banned firearms in 1972. Ireland’s homicide rate was fairly static going all the way back to 1945. In that period, it fluctuated between 0.1 and 0.6 per 100,000 people. Immediately after the ban, the murder rate shot up to 1.6 per 100,000 people in 1975. It then dropped back down to 0.4. It has trended up, reaching 1.4 in 2007. Australia: Australia enacted its gun ban in 1996. Murders have basically run flat, seeing only a small spike after the ban and then returning almost immediately to preban numbers. It is currently trending down, but is within the fluctuations exhibited in other nations. Plain and simple. Gun control has no significant impact on murder rates. Removing firearms does not typically create massive lawlessness. It is a moot point. These figures aren’t a secret. Why would the governments of these nations want a disarmed populace? For the answer, it is best to look at a nation that has had long-time gun bans that is currently relaxing their laws. Russia recently relaxed its firearms laws. For the first time in recent memory, a Russian citizen can carry a firearm. The prohibited items speak volumes about what a government’s motive behind disarming the population is. Russia has allowed “smoothbore long barrelled guns, pistols, revolvers, and other firearms, as well as Tasers, and devices equipped with teargas.” That’s almost everything, what is still banned? Rifles. So the Russian government has made it clear that the real objective is to remove rifles from civilian hands. The reasoning is pretty clear: you need rifles to overthrow a government. Poverty has a greater correlation to violent crime than access to firearms. Education and poverty are directly linked. In short, we don’t have a gun problem in the United States, we have a cultural problem.Home Depot. Most people in the gun control lobby know nothing about firearms or their construction. Everything you need to manufacture firearms is available at Home Depot. The materials needed to manufacture a 12 gauge shotgun cost about $20. If someone wanted to build a fully automatic Mac-10 style submachine gun, it would probably cost about $60. Every electrician, plumber, and handyman in the country has the materials necessary to manufacture firearms in their shop. The items are completely unregulated. They aren’t like the chemicals necessary to manufacture methamphetamines. How is the battle against that black market working out? We have a society that panders to the basest desires and instincts. One of those is violence. We live in a society where women are given dirty looks for breastfeeding in a restaurant, while over their heads on the wall-mounted television plays a movie that graphically depicts someone being tortured to death. We are desensitized to violence, and we have a generation of people that do not have the coping skills necessary to deal with reality. Firearms are the Pandora’s Box of the United States. The box is open, it can’t be closed through legislation. If you want to change society, you have to actually change the whole of society. You can’t blame an inanimate object that’s availability has absolutely no correlation to murder and expect to end violence.